Petro Poroshenko has taken the oath of allegiance to Ukraine and has assumed the post of the Ukrainian president. 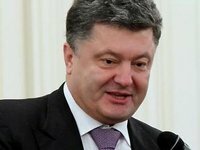 Poroshenko was sworn in as president at a meeting of the Verkhovna Rada of Ukraine on Saturday on the Constitution of Ukraine and the Peresopnytsia Gospels of the 16th century. Before that, Central Election Commission Chairman Mykhailo Okhendovsky said that Poroshenko had received the most votes during early presidential elections on May 25. The president's color was brought to the session hall, and Poroshenko signed the text of the oath. After that, the head of state signed a decree on assuming the powers of the commander-in-chief of the Ukrainian Armed Forces. The CEC chief then handed a presidential certificate to Poroshenko. He also received the state insignia of the head of state – the mace, the seal and the collar.